Heroin: The Deadly Narcotic That Was Once Medicine! Heroin wasn’t always perceived to be society’s scourge. Long before The Stranglers sang about Golden Brown, this highly addictive and often deadly narcotic was legal! Not only that, but it was also prescribed as medicine for children! Heroin has a long and fascinating history so let’s check it out. Heroin is a derivative of opium; an extremely popular drug in the 19th century which probably fuelled most of the poetry of the era! Morphine was developed from the drug in 1810 and was given its name after Morpheus, the Greek god of dreams because it put users in a euphoric dream-like state. It became widely available in America in the 1850s and was extensively used by soldiers in the Civil War. Morphine addiction gripped America, but a new drug called Heroin was developed in 1874 in Germany and seen as a solution to the morphine problem. It was brought to the United States soon after and marketed as a non-addictive, safe alternative for morphine. In the late 1890s, world renowned pharmaceutical company, Bayer, made a fortune by selling heroin as a cough, cold and pain remedy. Reports began to surface in 1899 that patients in the United States were developing a tolerance to the drug and the increasing number of addicts were begging for more. In the same year, Bayer was exporting the drug to 23 countries and producing up to one ton of heroin per annum. It was possible to buy heroin lozenges, pastilles, water-soluble salts, tablets and much more. There were even over-the-counter heroin kits which included vials of the drug along with a hypodermic needle. While one German researcher was ahead of the curve by claiming heroin was ‘a dangerous poison,’ his was almost a lone voice in the wind. From 1899 to 1905, medical experts wrote over 180 clinical works about the drug and the majority of them were positive albeit cautious. Meanwhile, salesmen were selling the drug as a ‘cure all.’ Apparently, heroin could cure colds, old age, depression, tuberculosis, and cancer. 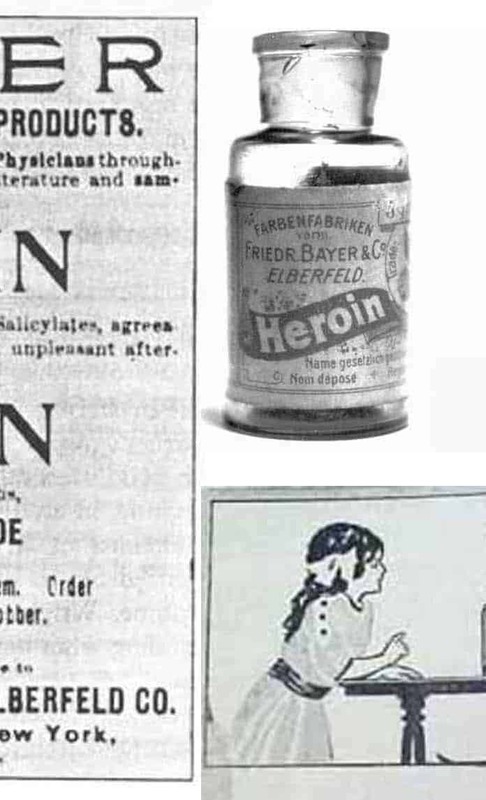 Bayer promoted the use of heroin in ads for children up until 1912. Its children’s campaign appeared in Spanish newspapers. One ad shows a mother spoon-feeding heroin to her kid with the caption ‘The Cough Disappears’ in Spanish. Another ad features two young sufferers of bronchitis reaching for a bottle of heroin across a table. The German company only stopped making heroin in 1913 upon news of a massive increase of heroin-related hospital admissions in large American cities such as New York and Philadelphia. The first steps towards banning the substance took place in 1914 with the Harrison Narcotics Act. This law stated that recreational use of cocoa leaf and opiate derivatives were illegal in the United States. However, it was still possible to get the drug with a doctor’s prescription. The Heroin Act of 1924 made all usage of heroin illegal in the U.S. Unfortunately; there were approximately 200,000 addicts in the country at that time. In the same year as the Heroin Act, the New York Police deputy commissioner claimed that heroin addicts committed 94% of all crimes in the city!